Do you feel like the meetings at work are never ending? Do your colleagues agree with you? If so, these could be the perfect business ecards to send to them. The ecards background are blue and shows two co-workers talking at a water cooler. 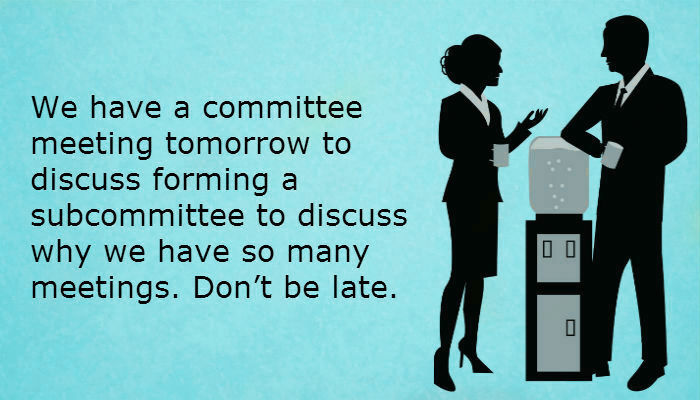 The caption on the ecards reads, ‘We have a committee meeting tomorrow to discuss forming a subcommittee to discuss why we have so many meetings. Don’t be late.’ If you understand the irony and think it’s funny, it’s guaranteed that your colleagues will too! So, boost morale in the office with this e-card and spirits will be lifted for the rest of the day. This ecard is also great for a co-workers birthday. You can add your own personalised message and your own signature to the card, along with many other features. It’s a great way of building strong relationships with your colleagues and they’re sure to appreciate the gesture. Take a look at the many other ecards for special occasions on this website and you may find that you never write on a card again! Would you and your colleagues like to know how to send the best e Christmas cards for business this year? Well have a look at us this Christmas and you will not be disappointed.